There are so many different types of lighting to choose for your home these days that it is easy to get overwhelmed. The helpful articles in LoveToKnow's Lighting and Electrical category can help guide you through the basics so you can make the right choice for your home, in terms of both aesthetics and installation. It's impossible to understate the importance of proper electrical installation. If you're planning to do it yourself, make sure you are fully aware of the National Electric Code as well as any local regulations that may apply where you live. If you're planning to hire a contractor, make sure he or she is fully licensed. Picking new light fixtures is a balance between what kind of light you need and what your style is in the particular room. The good news is there are many different ideas for all of these lighting types, so you should easily be able to find a style that suits your needs and your budget. Shopping for light fixtures can be a lot of fun since there is such variety. Find out about the various light fixture options, including track lighting designs for your kitchen, options for recessed lighting and more. You can even find out how to make your own chandelier and learn about toilet seat lights. Lighting can be just as important to the outside of your home as the interior, especially if you want to utilize your porch, patio, deck or other outside areas as an extension of the living space in your home. Find out about yard lighting options, including how to look for corrosion-resistant light fixtures and what to look for when choosing low voltage or motion detector lights. Lighting and electrical decisions are too important to make without conducting thorough research. When you're in the market for information on how to improve the lighting inside and outside of your home, the articles presented on LoveToKnow Home Improvement can be your go-to resource for information. 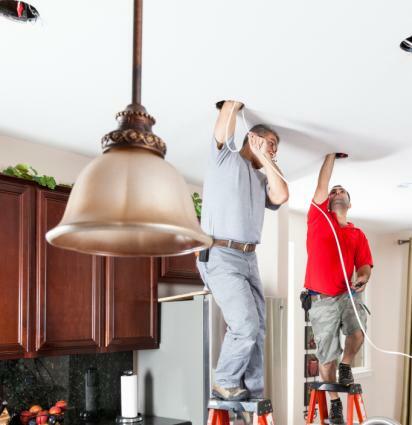 Whether you're looking for information on installing new halogen lighting or if you want to add a dimmer kit to existing lighting, you'll find what you need to know here.